Bhitarkanika is a national park located in the Kendrapara District Odisha in eastern India. The park encompasses an area of 672 km² of the Bhitarkanika Mangroves,a mangrove swamp which lies in the river delta of the Brahmani, Baitarani, and Dhamra rivers. The national park is surrounded by the Bhitarkanika Wildlife Sanctuary. Gahirmatha Beach lies to the east, and separates the mangroves from the Bay of Bengal. The park is home to the endangered Saltwater Crocodile (Crocodylus porosus), White Crocodile, Indian python,King Cobra, black ibis, darters and many other species of flora and fuana. The national park was created in September 1998 from the core area of the Bhitarkanika Wildlife Sanctuary, which was created in 1975.The sanctuary is the second largest mangrove ecosystem in India. 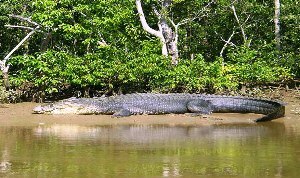 Bhitarkanika Wildlife Sanctuary in Odisha is also rich in avifauna, reptilian and mammalian population. The mangrove forests in the sanctuary are also a good habitat for King Cobra, Water Monitor Lizard and Indian Python. An area of about 4 hectares is visited by a large number of water birds every year from June to October. The area near Suajore creek at the sanctuary is frequently visited by Asian Open Bill, Cormorants, Darters, Black Ibis, Egrets and many more.